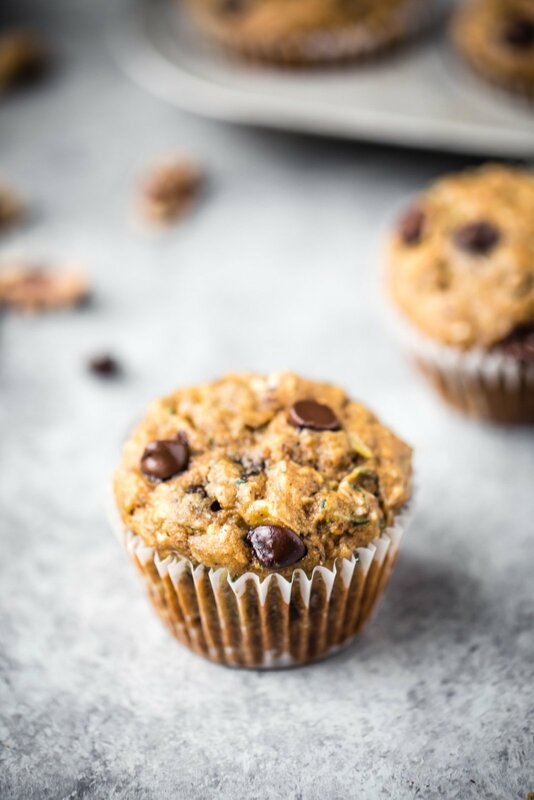 Healthy zucchini banana muffins packed with shredded zucchini, banana, heart-healthy walnuts, coconut and dark chocolate chips. 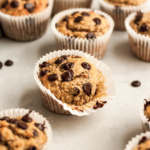 These delicious muffins pack in both fruits and veggies, making them the perfect healthy snack! Freezer-friendly and a great way to use up zucchini! Happy #AKZucchiniWeek 2018! This is my 3rd year of doing zucchini week on the blog and it’s always one of my favorites! How was your weekend? Tony and I saw a show at the Chicago Magic Lounge; it was such a fun date night and if you’re in the city, I highly recommend it. You can walk to the Green Mill after for music & drinks! Anyway, let’s get to this whole zucchini week thang. 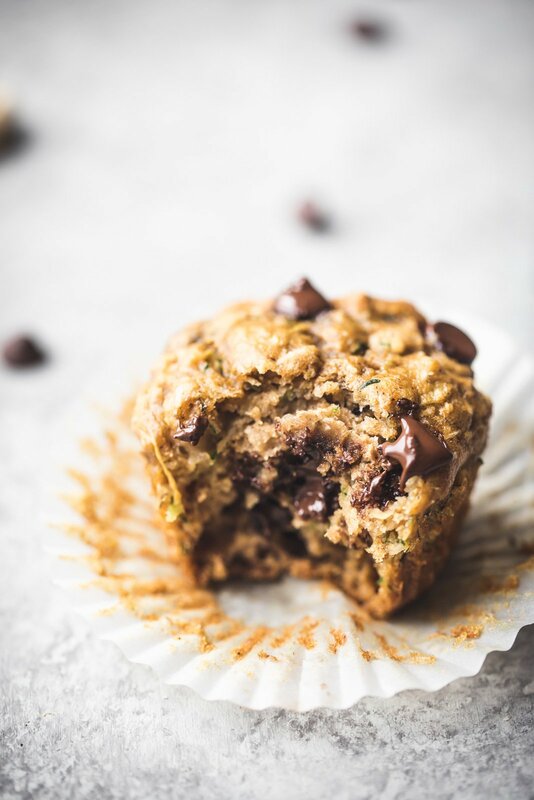 I thought it best to share this healthy zucchini banana muffin recipe first because you know how much I love muffins. Why? Probably because they’re portable, easy to make and freezer friendly too. 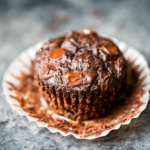 And what could be better than a little chunky monkey muffin (banana, walnuts, coconut and chocolate). THE BEST SNACK EVER aka time to make your kids eat their veggies. Or maybe just time for you to eat your veggies? Heh. Last week I had one for dessert every night with a little Soom chocolate tahini on top. Seriously it’s SO good (sometimes I use it in my tahini brownies). These muffins pack in fruit, a veggie, heart-healthy fats, whole grains and fiber. They’re dairy free and can easily be made gluten free too! Zucchini: Make sure you shred it and then squeeze it with a paper towel of excess moisture. This is critical! Bananas: Use ripe bananas and make sure you mash and then measure it out to 3/4 cup. They help to sweeten the recipe without adding a ton of additional sweetners. 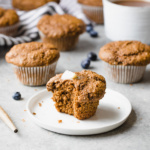 Cinnamon: Not only does cinnamon help to regulate blood sugar, it also adds a delicious flavor to these muffins. Olive oil: I love using a little olive oil in this recipe. 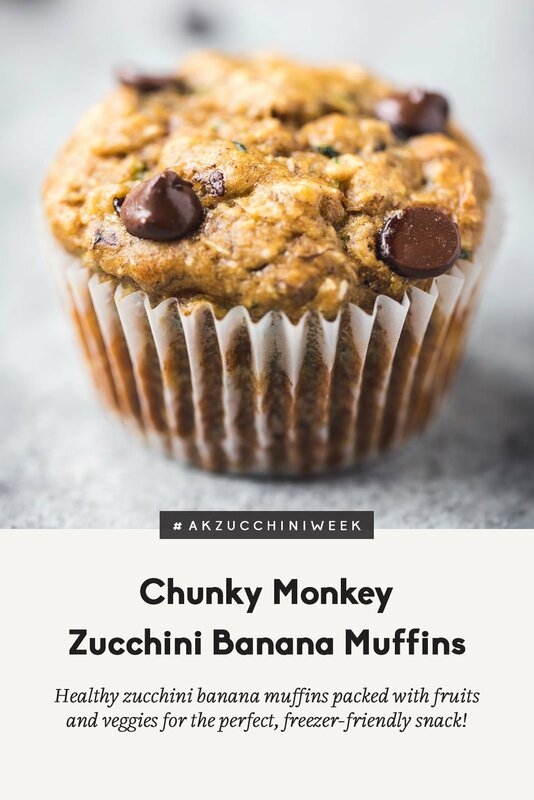 You really only need to use 2 tablespoons to keep the muffins moist, since banana and zucchini do the job! Please note that you can also use melted butter. 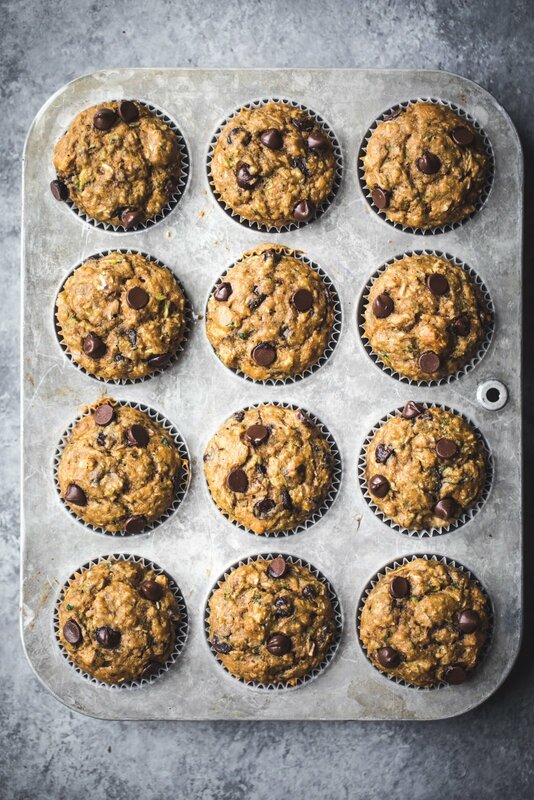 Honey: I love using honey to naturally sweeten these zucchini banana muffins. I typically use manuka honey, which offers many health benefits. Almond milk: To keep these dairy free, I typically use unsweetened vanilla almond milk. Walnuts: I love walnuts in this recipe because they add a delicious crunch, omega 3 and offer heart-healthy benefit. Chocolate chips: You can use dairy free chocolate chips if you’d like. I prefer dark chocolate. Unsweetened coconut: I love the texture a little coconut gives the muffin. Usually I use this brand. These muffins are 100% worth making. Keep them in an airtight container in the fridge for optimal freshness, especially during the summer months. ENJOY! xo. 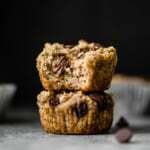 Healthy banana zucchini muffins packed with shredded zucchini, banana, heart-healthy walnuts, coconut and dark chocolate chips. 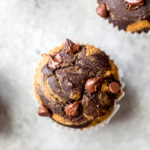 These delicious muffins pack in both fruits and veggies, making them the perfect healthy snack! Freezer-friendly and a great way to use up zucchini! Preheat oven to 350 degrees F. Line a 12 cup muffin tin with muffin liners and spray the inside of the liners with nonstick cooking spray. This is critical to making sure the muffins don’t stick to the liners. In a large bowl, whisk together the dry ingredients: whole wheat pastry flour, baking soda, cinnamon and salt. In a separate large bowl, mix together the following with a wooden spoon: zucchini (make sure it’s been squeezed of excess moisture), mashed banana, olive oil, honey, egg, vanilla extract, shredded zucchini and almond milk. Gently sir in dry ingredients until just combined. Fold in chocolate chips, walnuts and shredded coconut. Divide batter evenly between greased muffin liners. Bake for 22-27 minutes. Muffins are done when a toothpick comes out clean or with just a few crumbs attached. Allow muffins to cool in muffin tin for 5-10 minutes before transferring to a wire rack to finish cooling. Store muffins in airtight container in the fridge for up to 5 days. Muffins can also be frozen for up to three months. To make these vegan: Sub pure maple syrup instead of honey. Sub 1 flax egg instead of a regular egg. Make sure you use dairy free/vegan chocolate chips. To make these gluten free: I suggest using chickpea flour or an all purpose gluten free flour. To bake as bread: Make muffin batter as directed. Pour into a greased 9x5 inch loaf pan. Bake for 50-60 minutes or until toothpick inserted into middle comes out clean. 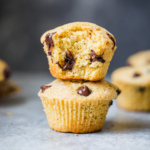 To freeze muffins: After muffins are done baking and cooling, transfer to an airtight container. Store in freezer for up to three months. Once ready to defrost, simply leave out for a few hours, or microwave for 30 seconds to a minute. 46 Responses to "Chunky Monkey Zucchini Banana Muffins"
Just made these. Absolutely delicious! Amazing!! Glad you like them! These sound delicious! What would be a good replacement for bananas in this recipe? You could try pumpkin puree, mashed sweet potato, or applesauce! Just note that they might not be as sweet. I wouldn’t recommend swapping flours, but try this one using coconut flour! I am in love with this recipe! It looks so delicious yet is so awesome how it packs in the fruits and veggies! I need to raid someone’s vegetable garden STAT. Can I use whole wheat flour if i don’t have the pastry one ? If so, would it be the same measurement ? Or white whole wheat ? I used regular whole wheat flour and they came out wonderfully! They’re not too dense, which can sometime happen with whole wheat flour. Good luck! Could you substitute almond flour or coconut flour? I was just going to ask if you could sub with almond flour, too! I wouldn’t recommend it – try these with coconut flour! I wouldn’t recommend swapping those flours here, but try this recipe using coconut flour! “Store in freezer for up to three muffins” hehe! These look and sound amazing! Can’t wait for my apartment to cool off next week so I can try them! Haha oops! Good catch 😉 Hope you love these!! I made this afternoon to go alongside yogurt for easy grab and go breakfasts this week. They’re absolutely perfect for that! Not too sweet and so well rounded! I didn’t have whole wheat pastry flour, so I used regular whole wheat and they turned out fine. I also realized too late I was out of coconut, so I just left it out. I can’t wait to make them again with it! These were fantastic! A new family favorite. The dozen were disappearing so fast I had to hide one to make sure I got to try it. I’m glad I did! Now I have to get zucchini to make some delicious pastries! These muffins look absolutely fabulous. 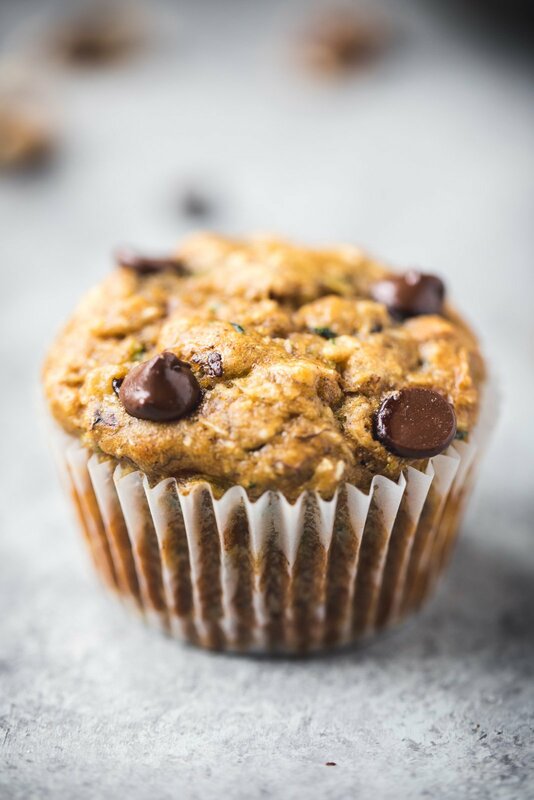 I love using oat flour, butternut squash, zucchini, cinnamon, and flax milk in my muffin batch! Tastes great, but these look absolutely INCREDIBLE and probably taste even better. Who doesn’t love chunky monkey after all? Do you measure 1 cup of zucchini before squeezing out the water, or 1 cup afterwards? 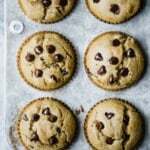 Can I switch to a GF flour or will it change the receipe in the wrong direction? I put a couple of suggestions in the notes section 🙂 you could try chickpea flour or an all-purpose GF flour! Never disappointed with how any of your muffin recipes turn out- love this one! Hi Mary Beth! Amazing 🙂 I’m so glad you both loved these. Perfect for breakfast! Just made these for the second time- yum!! For nut allergies, can you use coconut milk instead of almond milk? And just omit the walnuts?